Topps and WizKids announces they are auctioning a limited-release 2005 MLB SportsClix collector's tin to raise funds for the American Red Cross' tsunami relief efforts. 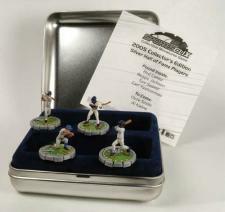 The tin includes limited figures of Tom Seaver, Reggie Jackson, Carl Yastrzemski and Rod Carew. The auction is being hosted by eBay at http://cgi.ebay.com/ws/eBayISAPI.dll?ViewItem&item=5956367420. 2005 MLB SportsClix, releasing March 30th, will introduce several Hall of Famers for the first time including Babe Ruth and Lou Gehrig.